Ushahidi in Haiti: What’s Needed Now | Wait... What? My main experience with disasters comes from working at an international development organization in El Salvador and happening to be the only senior manager who wasn’t on annual vacation when a huge earthquake struck almost exactly 9 years ago, on January 13, 2001. The rush to act was immediate, and it was a lot of learning by doing. I got handed the responsibility by fate I suppose and didn’t do such a bad job of it, if I do say so. At that time we were pretty unprepared; something that has certainly changed since then in the organization where I work. We now have country level disaster plans at hand and support a lot of disaster risk reduction and preparedness work with local communities and governments. One of the main challenges for us in responding to the Salvadoran earthquakes in 2001 was information: lack of information, wrong information, too much information to sort through, outdated information, etc. We spent way too much time in staff meetings and meetings with other organizations/government sharing what we had done and what we were planning to do, only to find out that everything had changed while we were sitting there, and some decisions were no longer valid. There was no effective way to manage all the information in the constantly moving and changing circumstances. I’m sure things have changed quite a lot in disaster work since 2001, and since 2005 when I spent about 6 weeks in India and Thailand after the Tsunami, but I would bet that information management will still be a major challenge during the relief and recovery efforts in Haiti following the January 12, 2010 earthquake, especially given the scale of the crisis and the number of agencies who are already working there or are just now arriving to set up shop. Today’s technology should allow us a better way to manage this information. I hope that organizations working on the ground in Haiti will take advantage of the shared and open digital information systems available to them that can be updated in various ways by various people in various locations. The convergence of information and communication technologies (ICTs) such as digital mapping, crowd sourcing and crowd feeding of information, GPS, mobile phones and SMS, geo-visualization for rapid decision making and trend spotting will be put to a massive test as the disaster response in Haiti unfolds. The place where these ICT tools are converging right now into one ready to use platform is at www.haiti.ushahidi.com. (I confess that I’m unaware of other options that offer the same or similar crisis management capacity – feel free to post other examples in the comments section). [update: for regularly updated detailed info on Ushahidi and other digital tools being used in the Haiti Crisis, visit the Ushahidi Situation Room]. According to the Ushahidi blog, work on the Haiti crisis map began about 2 hours after the massive quake struck, thanks to a global effort of people linked to Ushahidi, Frontline SMS/Frontline SMS: Medic, UN OCHA Colombia, the International Network of Crisis Mappers, and the US State Department (and probably others behind the scenes that haven’t been mentioned yet). The system is now operational. The in-country short code 4636 went live on January 16th. What is Ushahidi and how does it work? Ushahidi could be described as a mapping tool and also as a platform I suppose. Each Ushahidi ‘instance’ is created based on the information needs of whoever is setting up the instance, and a map of a particular geographical area. Via email, SMS, Twitter, or by filling in an on-line form, anyone can send in information to populate the map with information. This information falls into specific topic areas that have been decided beforehand by whoever is setting up the site. (Ushahidi instances have been used to track drug stock outs, to monitor elections and human rights abuses, and in crisis situations, for example.) In the case of Haiti, it’s deaths, emergencies, threats, responses, missing persons, etc. To really understand how this works, the best thing is to just visit the site. Two of the basic concepts behind Ushahidi are “crowd sourcing” and “crowd feeding”. Crowd sourcing means information is obtained from the “crowd”. Crowd feeding means that the collected information is consolidated and fed back to that same “crowd” so that they are better able to make decisions. People standing right there on the ground usually know what is happening right there on the ground better than people visiting periodically from centralized headquarters, and via Ushahidi, that information is pulled in from the sources on the ground in almost real-time. Giving consolidated information back and/or responding to those who provided it completes the circle. With a large enough amount of information input, any bogus incident reports can be identified. I won’t go into all the discussions around the validity of crowd-sourced information as it’s been a large debate, but seems to play out that yes, you can trust the information to the degree necessary to help make quick decisions in times of crisis or emergency — and this information is better than no information or information that comes too late. In fact, in September, I participated in a meeting about geo-visualization at Google’s offices in Washington, DC (see my before lunch and after lunch posts) and heard presentations by both the American Red Cross (ARC) and the US Federal Environmental Management Association (FEMA). Both organizations talked about the need to trust citizens to report on what is happening right in front of them, and that these reports are every bit as reliable as reports by experts, and a whole lot quicker because people have mobile phones now. Pulling in information from citizens and mapping out the situation visually can be a huge resource for those making decisions about response. What is needed now for Ushahidi in Haiti to work to its fullest potential is for people to share information about what is happening where they are. The general public in Haiti can text a message into 4636 to submit a report giving their location and telling about their situation: missing persons, need for medical attention, supplies needed, help that has already arrived, changing priorities, etc. 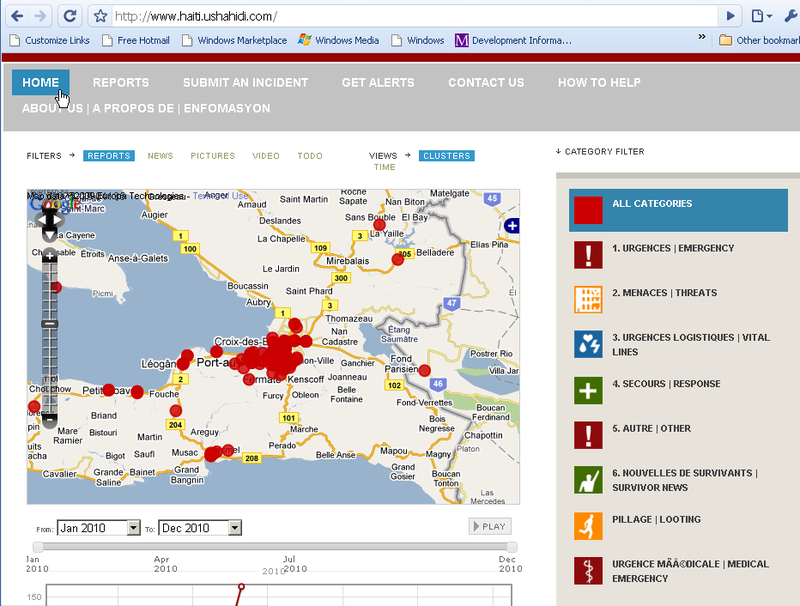 [Internationally use 44-76-280-2524, or report using the web form at the Ushahidi Haiti site]. One aid agency can’t canvas the whole country alone, and Ushahidi offers a way to get real information from real people on the ground in near real-time. I think it would have much been easier in El Salvador in 2001 if we had the ICTs then that we have now. I hope people and organizations take the best advantage of them in 2010, now that they are available. UPDATE: Here is a beautiful overview of the Ushahidi effort, posted on the Ushahidi blog on Feb 9.